THE GYMPIE GourMAY month kicked off yesterday at Town Centre Growers Market in Memorial Park. With over 20 food and produce stalls on site and dozens of people watched chef Matt Golinski cook a range of meals using locally sourced produce. 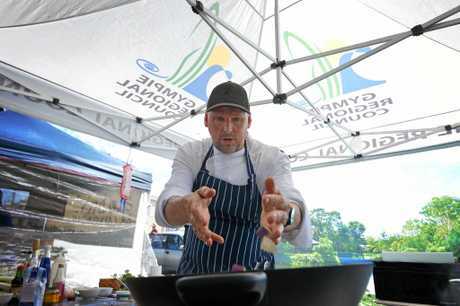 In his role as Gympie Region's official Food and Food Tourism Ambassador, Golinski said the overwhelming strength of Gympie is the diversity in food available. "We had a bit of a meeting a few weeks ago where a few producers got together and work-shopping what it is that makes Gympie special and I think the overwhelming word that came up was diversity. "We have got so much different stuff here you go to other regions that are inland they don't have the seafood we've got. "We've got all these different micro-climates in the Gympie region where we can grow all sorts of different things as well as getting seafood from the ocean. "So we are very, very lucky here, and this market is a great reflection of that. You can see that there's people are doing all sorts of things in this region. "Lots of free range poultry and livestock these days which is fantastic to see, but loads of different fruit and vegetables all year round." Mr Golinski said he truly loves the region and the abundance it provides. "Well I love it as a region, I love being here, I love the actual landscape, the people are great and from me as a chef, I am interested in ingredients, I am interested in seeing how things grow and meeting the farmers who grow those things. "We're are lucky enough that in this region we have a lot of small producers that are very, very passionate about what they do and they like to have people like me come and see exactly what it is they do that makes their food special." A community shift towards local produce is heralded by Mr Golinski as a huge positive for the Gympie region. "Look, you can feel the momentum of that whole local produce and the support for it, you can feel it building all the time with things like the markets and a lot of producers going out there and just really throwing themselves into really promoting what they're doing themselves, which is great they are becoming really good business people. "But the thing that the public can do to support that and make that stronger and stronger is to buy that, buy local. "The ultimate message is: source out local produce. "Support that because (A) you're supporting the local economy, you're helping out farmers who struggle to make ends meet most of the time, but also you're eating better food, you're eating fresher food, you're eating better quality food. "And we all know that these days that if you want to produce good food, you can start with bad ingredients. "That's the starting point, it has to be good ingredients and the best ingredients that you'll get is is the ones that are closest to the source." Gympie's GourMAY Eat Local Month also includes the 5Chef's Long Table Lunch, Goomeri Pumpkin Festival, Gympie Show and the Gympie Garden Expo. For more information visit www.gympieregionalproduce.com.au, follow @GympieRegionalProduce on Facebook. You can also visit www.gympie.qld.gov.au/greatgympie or visit the Gympie Regional Council's Facebook page.